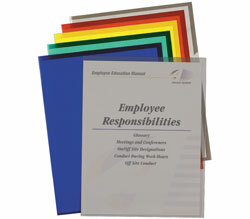 Deluxe non-glare vinyl project folders help you categorize your work projects. Here's a tip: use a marker to label these letter-size folders. Deluxe non-glare vinyl project folders help you categorize your work projects - attractive and practical. Use them to organize your week or keep materials for a specific meeting in one place. Embossed pebble grain finish. Sealed on two sides with thumb cut front for easy access. Letter size. 50/BX. Hi. I'm John with C-Line and today we're going to talk about our Deluxe Vinyl Project Folders. These project folders are made from super heavyweight vinyl for maximum durability. They are almost twice as thick as other project folders and the pebble grain textured surface gives them a heavyweight feel. The folders are open on two sides and have a convenient thumb cut on the front and slightly oversized back for easy access to your papers. They can comfortably store up to 50 sheets. Plus, the non-glare finish allows you to quickly identify the folders' contents. Project folders are a great way to divide and organize your projects. They can be used by themselves or to subdivide file folders with multiple projects and activities. C-Line's Deluxe Vinyl Project Folders store projects, reports, paperwork and more. They're great for organizing your home, school and business. Order yours now! That's all we have for today. I'm John with C-Line. Thanks for watching.